End-user satisfaction and productivity are the ultimate measures of application performance. By monitoring the end-user experience continuously, IT managers will be alerted when users experience poor performance, slowdowns or outages. Many modern applications have built-in instrumentation to track and report key performance metrics. This passive monitoring approach is not effective when users are not actively using the applications, or when instrumentation is not available (for example, legacy applications and custom applications). Therefore, a synthetic monitoring approach is required to actively and continuously test business transactions and preemptively identify performance problems. 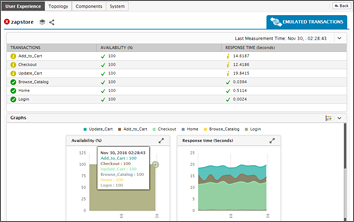 Synthetic monitoring complements eG Enterprise’s real user monitoring capabilities to achieve complete end-user experience management and performance assurance. Administrators can create synthetic transactions and monitor the performance of simulated transactions from various locations and endpoints. 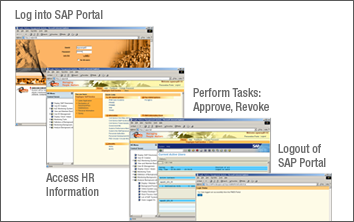 eG Enterprise emulates a real user accessing an application, records and plays back the scenario 24x7. Using the same thin client (e.g., Citrix), thick client (e.g., SAP GUI) and web applications that real users access, the system performs a sequence of mouse clicks, data entry operations and keystrokes based on pre-recorded scripts. Observing the responses at each transaction step, eG Enterprise matches the results with expected patterns and baselines, and reports the performance metrics in an intuitive web console. Based on the results, IT teams can quickly determine which transaction in a session is slow or not working. A typical example of synthetic monitoring is the emulation of a business transaction where a user logs into SAP application, accesses records, updates information, and finally logs out of the session. 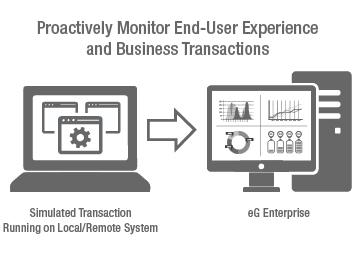 Synthetic transaction monitoring with eG Enterprise enables you to test a new feature/function of your application before deployment. So, well before real end-users experience the new functionality, you can simulate scenarios and synthetically test their performance. Are the critical business applications available to handle user requests? 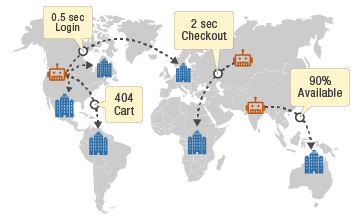 What is the total response time for a typical user access to a business-critical service? Which of the transactions of a service is slow or failing? Are there specific times of day when the slowdown occurs? How does the performance vary depending on the geographic location from which the user is connecting? 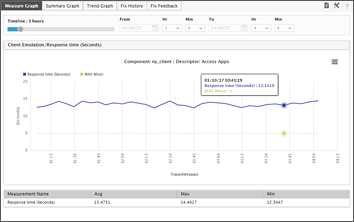 Easily identify what is affecting the user logon experience: authentication, enumeration, application launch, etc.